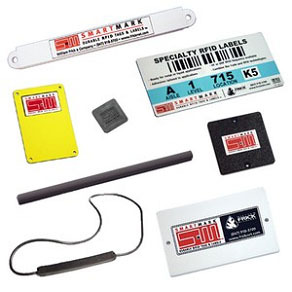 SmartMark Durable RFID tags and labels are designed by the harsh environment experts at William Frick & Co. to perform where other tags fail. Constructed using custom laminations, UV-stabilized plastics, impact resistant rubber and other durable materials, they offer a long-lasting solution for hard-to-tag items and difficult applications. Every tag is subjected to real-world conditions and fully-tested to ensure they perform reliably outdoors, on the warehouse dock or on the factory floor. SmartMark tags can be designed using today's most popular inlays from Alien, Omron, UPM Raflatac, Symbol, and others. Or, you can employ Frick's own unique inlay designs for extended read ranges. Sizes, shapes and designs can be altered to fit your environment and your project's unique requirements. Rapid prototyping and testing are available and Frick's RFID experts are on-hand to assist you at every stage to ensure a seamless and effective implementation.